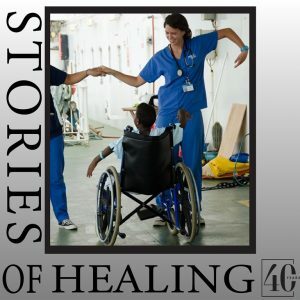 Yaya didn’t dare to hope his terribly twisted legs could ever be restored, even when he heard the Mercy Ship arrived in the port city of Conakry where he lived. ‘I did go to the screening with my friend,’ Yaya confessed, ‘but I lost my courage.’ The little boy left without being examined. 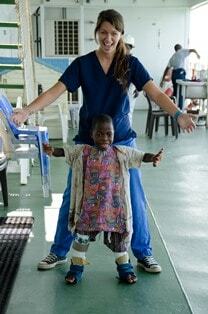 But Dan, one of the Mercy Ships orthopaedic staff, spotted him in the distance. Later another crew member saw Yaya on the other side of Guinea’s capital city, and took a picture … it was the same little guy that Dan was looking for, knowing Mercy Ships could offer the surgical intervention to straighten his legs and change his life. Dan finally tracked Yaya down at the local Mosque and delivered the news that he had an appointment at the hospital ship if he wanted it. But another seemingly divine coincidence occurred that finally put Yaya and Mercy Ships together. A government official, Cellou, who had befriended Yaya at the Mosque, was at the Mercy Ships Dental Clinic that same week in 2012. He casually asked what a young boy with deformed legs needed to do to get an appointment. It was quickly realized that the boy in question was Yaya and that he just needed someone to bring him to his appointment. Cellou immediately went to Yaya’s grandmother with the news about the boy’s appointment. They agreed that he would go to the hospital ship with Yaya. 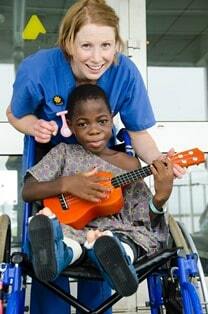 Yaya was born with a condition that caused his bones to be very brittle. When he began to walk, the pressure on the bones caused multiple fractures. 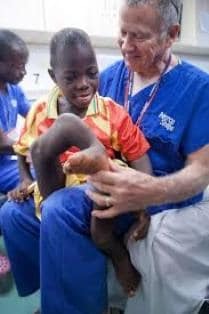 The surgery he had on board aligned Yaya’s leg bones correctly, and the two rods installed gave his legs the needed strength and structure so he can walk normally. ‘He left the ship three months later walking with crutches on straight legs,’ recounted Amber. 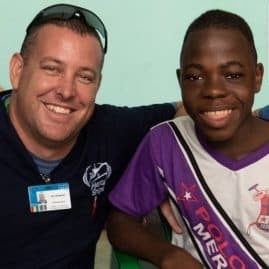 POST NOTE: 2018 – The Mercy Ship has returned to Guinea, and Yaya was scheduled for follow-up. We just received this photo of Yaya and his friend nurse Dan. It is pretty amazing they were able to touch base in post-Ebola Guinea, now six years after his life-transforming surgery.